Department of Immunology and Microbiology, University of Colorado School of Medicine, Aurora, Colorado, USA. Address correspondence to: Raul M. Torres, 12800 E. 19th Avenue, MS 8333, Aurora, Colorado 80045, USA. Phone: 303.724.8669; Email: raul.torres@ucdenver.edu. J Clin Invest. 2019;129(3):965–968. https://doi.org/10.1172/JCI125893. Primary antibody deficiencies are the most common immunodeficiencies in humans; however, identification of the underlying genetic and biochemical basis for these diseases is often difficult, given that these deficiencies typically involve complex genetic etiologies. In this issue of the JCI, Bouafia et al. performed whole-exome sequencing on a pair of siblings with primary antibody deficiencies and identified genetic mutations that result in a deficiency of ARHGEF1, a hematopoietic intracellular signaling molecule that transmits signals from GPCRs. ARHGEF1-deficient lymphocytes from the affected siblings exhibited important functional deficits that indicate that loss of ARHGEF1 accounts for the observed primary antibody deficiency, which manifests in an inability to mount antibody responses to vaccines and pathogens. 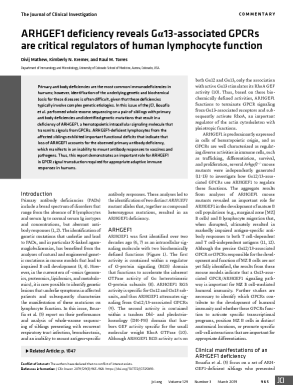 Thus, this report demonstrates an important role for ARHGEF1 in GPCR signal transduction required for appropriate adaptive immune responses in humans. Continue reading with a subscription. A subscription is required for you to read this article in full. If you are a subscriber, you may sign in to continue reading. Click here to sign into your account. Please select one of the subscription options, which includes a low-cost option just for this article. At an institution or library? If you are at an institution or library and believe you should have access, please check with your librarian or administrator (more information). Please try these troubleshooting tips. Purchasing this article will give you full access for the calendar year. This will give you access to every article on the site for 24 hours. Individual online subscriptions give you full online access for the calendar year. Individual print subscriptions give you the print journal and full online access for the year. Subscribing to JCI This Month also gives subscribers full online access for the calendar year. *Price outside U.S. and Canada: $225.